In much the same way that “Oscar buzz” films tend to come out at the end of the year, so too have Winnipeg’s newest noteworthy restaurants. On that note, here’s a list of places that are less than two months old to try out in 2018. The newest concept(s) from Scott Bagshaw – arguably Winnipeg’s most nationally acclaimed chef (his second restaurant Enoteca was Winnipeg’s only restaurant to have made enRoute’s 10 Best New Restaurants in Canada list, while his third restaurant Máquè made the long list) – have been receiving rave reviews since it opened in early December in The Forks Market. Corto offers counter service (with limited bar seating) featuring dark roast coffees, hot chocolate, side dishes and Italian sandwiches that have been described to us as [swear word] mind blowing (just check out this buttermilk-fried chicken version of a parm sandwich). You can also get a combo of a sandwich, side, and a glass of wine or beer for just $19 -- yes please! 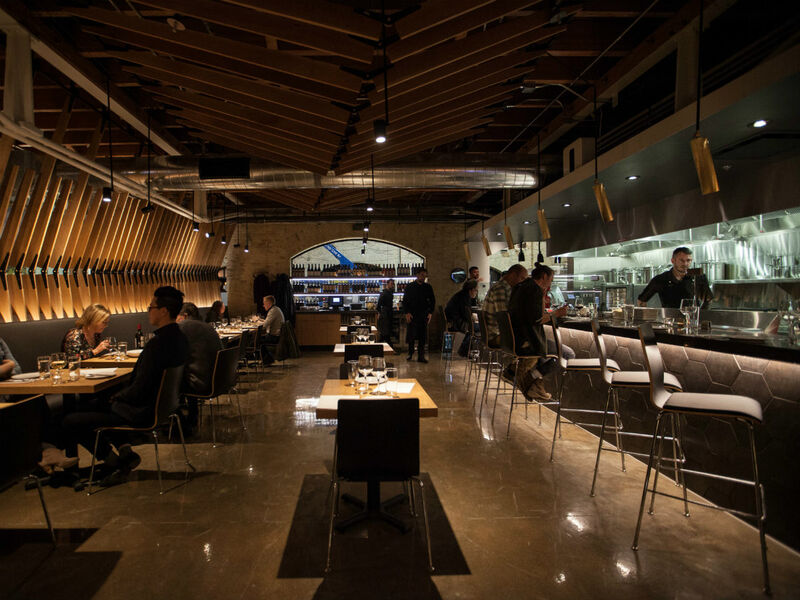 Passero is a gorgeous space with a shimmering open kitchen and wood slats adorning the walls (Number TEN Architectural Group, the same firm behind the redesign of The Forks Market, designed the room). The menu covers modern Italian small plates, including housemade pastas (the gnocchi with black garlic and truffle will have you licking the plate), meat, vegetable, seafood and raw dishes. This being a Scott Bagshaw restaurant, you can expect sublime plating, knowledgeable staff, a great wine list and moan-inducing flavour combinations. Corto is open from 11 a.m. to 5 p.m., while Passero opens for dinner at 5 p.m. Reservations available (and recommended) for Passero at info@passerowinnipeg.com or by calling 204.219.7300. Some have said this is the best octopus they have had in the city. Some have said ever. I love this dish. Charred octopus, black romesco, smoked creme fraiche, nduja. Okay, technically the Red Ember’s brick-and-mortar location in The Forks Market has been open late October, but to omit it from this list would be a travesty of the highest order. Winnipeg’s most-popular (and largest) food truck’s location in The Forks utilizes a show-stopping Forza Forni oven to produce its Neapolitan-style pies (somehow that airy, yet chewy and crunchy crust seems even better), while a great deal of the toppings comes right from local Zinn Farms, which is operated by Red Ember owner Steffen Zinn’s relatives. This location in The Forks is also licensed with a fine selection of wines from Element Wine (also located in The Forks Market). Simply put, this is some of the best pizza you can get in Canada – seriously. On the menu everyday. Happy pig; vodka sauce, house made Berkshire sausage, fontina, red onion and parsley. The story behind Winnipeg’s newest ice cream shop (it just opened on December 21) is even sweeter than its fabulous ice cream. Owner/chef Joseph Chaeban is a second-generation cheese-maker (who is also a dairy scientist) of Lebanese decent who started to focus on ice cream in 2016. His wife Zainab Ali (Chaeban’s in-house flavour expert) is from Syria, and it was through members of the South Osborne Community (where the store is now based) that the couple were able to get assistance to get 13 of her family members out of the war-torn country – some of whom now work at the shop. They are currently making around 12 flavours of ice cream, including some innovative numbers like Baba Beets (made with local beets), Abir Al Sham (featuring pistachios, cashews, rose water, orange blossom water, vanilla, orichid powder and ricotta), and others, all of which use 100 per cent natural ingredients. Open Monday to Sunday, 11 a.m. to 11 p.m.
if fate hadn’t lead me to @forth_wpg, ice cream was my next plan. when I heard of @chaeban_ice_cream I was sad, mixed with hopeful. But still sad. All the coulda’s and woulda’s. but then I heard their plan...and the good good people involved in it... and then this past weekend I tried the ice cream. good lord. you guys, it’s SO good. especially the abir al sham. holy dinah. I’m so happy & excited for them. go try and while you’re at it, google them if you haven’t heard their back story. Some of the team behind The Roost (front-of-the-house guys Caiden Bircham and Ike Hedenstierna, and chef Sean Brenard), one of Winnipeg’s most-charming little cocktail bars, along with farmer Will Bergman from Bergman Farms and Luke Joyal have just opened Winnipeg’s newest prix fixe restaurant. It's all located in a 50-seat exposed beam and brick setting that is terribly handsome. The current gist is you get four courses for $46 – using mainly ingredients that Bergman grows on the farm – while the wine menu features numerous natural wines. Open Thursday to Monday, 5:30 p.m. ‘til late. Email oxbowwpg@gmail.com for reservations. To say I’m beyond proud is a huge understatement. Welcome to Oxbow, Winnipeg’s newest restaurant of 2018. The team of Ike, Luke, Sean, Caiden and many others have produced a place that has far exceeded my expectations. Now it’s on me to do my best as the farmer, and bring the best of what our land produces to the tables within these walls. Hope to see you there sometime soon! This Creole restaurant by the same owners as St. Boniface’s Bouchée Boucher opened in early December in one of Osborne Village’s most-iconic locales (formerly Basils, whose last incarnation was Black Rabbit Bistro). The new owners have done a fine job brightening up the dining room, while this summer you can once again expect the place to boast one of the city’s best courtyard patios. Food wise, the main specialty is Louisiana-style seafood boils, meaning it’s a place to get your hands dirty, while throughout the menu you’ll find no shortage of crawfish, shrimp, catfish, gumbos and po’boys on the lunch menu. They also offer everything from weekend brunch – which will be a welcome addition to The Village – to a late-night menu of snacks. Open 11 a.m. to 2 a.m. Monday to Friday, 10 a.m to 2 a.m. on weekends. 204.504.5966. The latest project from Chef Alexander Svenne (Bistro 7 ¼ was the main restaurant to put him on the map), is a tiny little brunch spot in St. James that just opened on December 4. The primarily French menu has an assortment of egg dishes (all reasonably priced under $13), sweet and savoury oatmeals, and a daily selection of “morning buns” that are proving to be quite popular. Open 8 a.m. to 3 p.m., Tuesday to Saturday.